Dance, party and mingle in Nashville's only open air party bus! Complete with your own LED lit dance floor, a personal bartender, massive sound system and room enough for up to 30 friends, this is the Downtown Nashville party experience. Roughly a 2 hour tour, you will explore the sights and sounds of Music City as you cruise through Downtown Nashville in the ultimate "seen and be seen" party bus. Minimum of 5 Guests to Book! 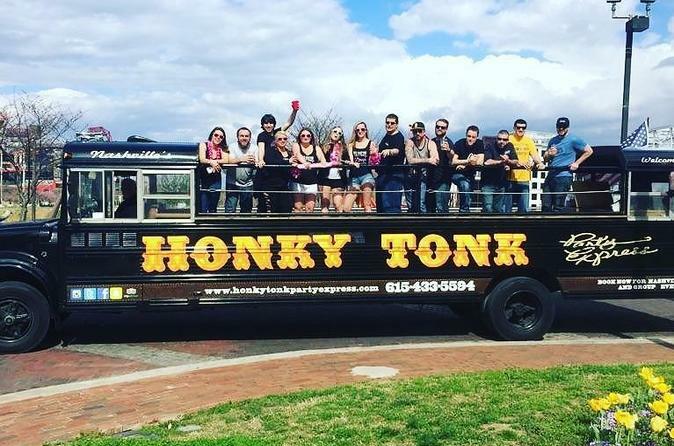 Nashville's only open air party bus is guaranteed fun in Music City. With seating for 22 guests and a built in bar and bartender, your party experience will be like no other in Nashville. Your tour includes seeing the sights of Lower Broadway, the Gulch, Demobrauen Hill, SoBro, Titans Stadium and Downtown Nashville. Dance the day or night away as you listen to your favorite songs with our massive sound system. Your tour begins 2 blocks from Downtown and lasts about one hour and forty five minutes. The tour is BYOB, or Bring Your Own Beverage. Coolers, cups and bartender will be provided. You will cruise around 10 mph so you can see the sights and move around in the bus You won't just go to the party- you'll be the party!